LOS ANGELES — Arnold Barboza Jr. earned the biggest knockout win of his young career by wiping away “Mile High” Mike Alvarado in the third round Friday night, furthering his chances into contention. Featured on ESPN+, the junior welterweight contest topped the undercard of Vasiliy Lomachenko vs. Anthony Crolla at the Staples Center. “To perform like I did in front of my hometown fans, it doesn’t get better than that,” Barboza said after the victory. From nearby South El Monte, California, Barboza (21-0, 8 KOs) electrified the crowd with a perfect one-two that flattened Alavardo to the canvas 49 seconds into the third. Alvarado, 38, stared up at the rafters as he laid on his back before trying to get up with the help of the ropes. The 38-year-old failed to do so but got upright before Thomas Taylor’s count got to ten, however, his wobbly legs gave way and the referee then had to save him from another fall. 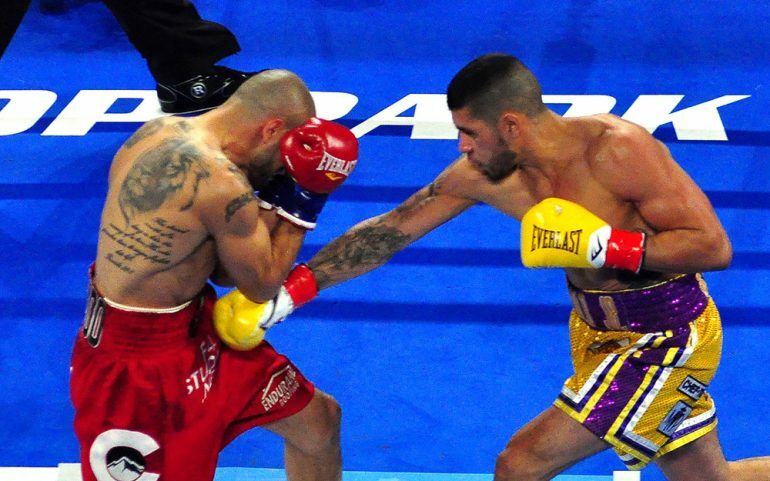 Alvarado (40-5, 28 KOs) was already showing he was a step behind in the two rounds preceding the knockout. Compared to Barboza, who is 11 years his junior, Alvarado was slow to react to the punches coming at him and the shots he’d throw back could be seen coming a mile away. He also couldn’t anticipate Barboza’s right uppercut, which constantly connected in the early going. The former world champion at 140-pounds still tried his best to land a right hand that would bail him out of this predicament, however, all Barboza had to do was press forward and take the victory from the aged veteran, who was fighting far past his prime but wielding a double-edged sword in a sport that kept his head on straight in the first place. Kazakhstani middleweight prospect Janibek Alimkhanuly looked impressive in his unanimous decision win (100-90 x2, 99-91) over Cristian Olivas to remain unbeaten after his first 10-round fight. After two rounds of both fighters feeling each other out, Alimkhanuly and Olivas stared each other down as they went to their corners before the third. The gawking led to action picking up in the third, where Alimkhanuly started showcasing a creative display of punching from the southpaw stance. Alimkhanuly made it hard to predict what was coming and from where it was coming from as he threw virtually every punch in the book with either hand. His mainstay was a precise jab that often split the guard of Olivas and forced him to reset himself. The punch also came from the hip of Alimkhanuly, whose relaxed stance signified his composure in what was his sixth fight as a pro. 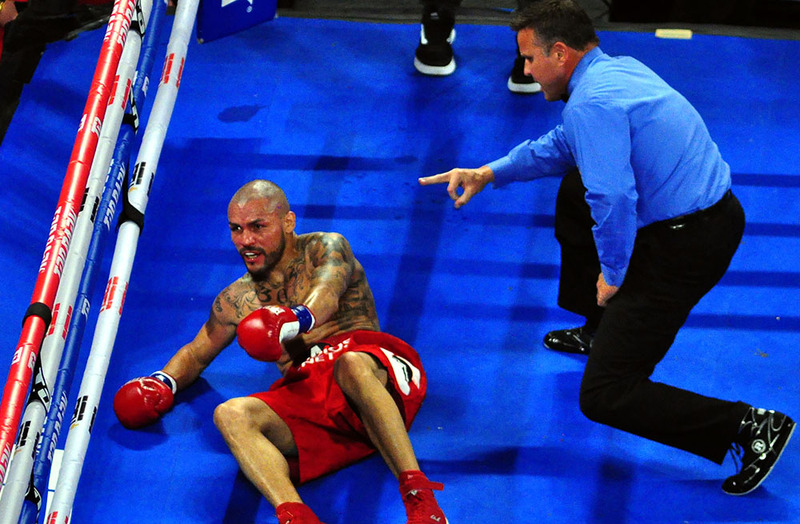 Olivas (16-5, 13 KOs) was red in the face by the end of round six, and out of ideas for the remainder of the fight aside from bottling himself up on the inside. Alimkhanuly (6-0, 2 KOs) stood his ground and popped that jab well enough to prevent Olivas starting the fire fight he desired. A native of Mexicali, Mexico, Olivas was able to tough it out and make it to the bell to remain unstopped in his four defeats. However, this one extended a losing streak to three while Alimkhanuly picked up a couple of regional middleweight belts from the WBC and WBO that will surely nudge his ranking toward the top 15 soon enough. All this on an apparent injury he suffered during the fight, but Alimkhanuly certainly didn’t make it obvious. Ruben Rodriguez beat Romel Snegur via majority decision (40-36, 39-37, 38-38) to remain unbeaten but his performance was far better than the scores may imply. A junior welterweight prospect out of nearby Indio, California, Rodriguez (6-0, 2 KOs) imposed himself with a jab far superior than his opponent’s. In the second round, Rodriguez, 22, hurt Snegur thanks to the power shots coming off that jab. Earlier in the round a right hand popped Snegur on the chin to draw a reaction from the crowd, but it was nothing like the left hook that wobbled him badly and almost knocked him down. Snegur (3-4-1, 2 KOs) had his chin up and out for Rodriguez to easily target throughout the four rounds, and it was a testament to the lack of fundamentals compared to the prospect out of Robert Garcia’s Boxing Academy. Though Snegur was caught and hurt again in the remaining two rounds, the Portland native was willing to fight on the inside where it better suited his chances. Italian heavyweight prospect Guido “The Gladiator” Vianello scored a first-round knockout of Lawrence Gabriel to earn his third career win. The contest was scheduled for six rounds. Vianello (3-0, 3 KOs) hurt his opponent with the first clean right hand he landed. The shot to the chin flustered Gabriel backward to the ropes, bouncing him forward into more oncoming right hands that battered him to the ground for a knockdown soon after. Fighting out of Syracuse, New York, Gabriel (3-2-1, 2 KOs) got up in time of Thomas Taylor’s ten-count, but a slight wobble backward compelled the referee to wave it off. By California rule, the win is officially a knockout and Vianello achieved it in 49 seconds. In the opening bout of the Top Rank undercard, Alexander Besputin earned a wide unanimous decision (100-90 x2, 99-91) win over Alfredo Blanco to remain unbeaten and maintain his IBF No.5 welterweight ranking. Besputin (13-0, 9 KOs) didn’t have much trouble controlling nearly every aspect of the fight, but his Argentine opponent made it awkward enough to prevent him from looking dominant in a virtual shutout on the cards. Making his United States debut, Blanco constantly switched stances and made it awkward for the Russian southpaw from the start of Round 1. Besputin, 27, relied on his jab to set up a straight left hand down the middle, and right uppercuts were thrown often whenever Blanco crept inside by mistake. Blanco (20-8, 11 KOs) bit down and tried to counter with looping right hooks to create some thrilling exchanges in the early rounds, but with little success. The desperation shots were few and far between by the end of the fight. Besputin tried his best to get creative with his combos thanks to a stationary opponent down the stretch, but he couldn’t find a shot effective enough to score a knockdown or seriously hurt Blanco.